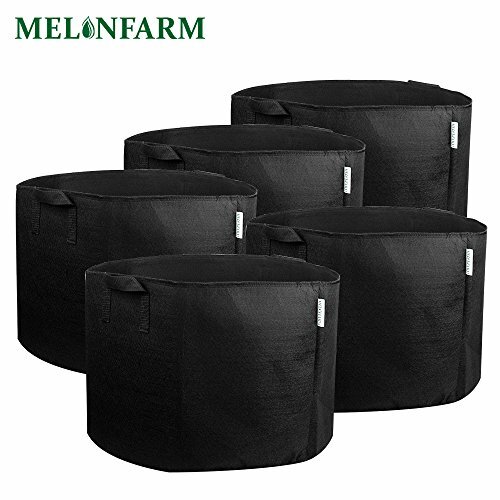 MELONFARM Grow Bags 15 Gallon 5-PackThese grow bags can help you grow vegetables in any sunny spot: your deck, patio, even your front steps! Unlike cheaper versions, our thick, felt-like fabric planters provide excellent aeration and drainage for strong, healthy root systems. Aeration:One of the best attribute is the aeration provided by the many holes you drill into the bottom of the inner plastic bucket. Drainage:The #1 killer of plants grown in a container is inadequate or poor drainage.With a grow bag, drainage is quick and thorough, almost impossible to over water in a grow bag. Planting Mix:A container garden must use a light fluffy potting mix to create tiny air pockets for aeration and to provide drainage. Heat:The plant's roots are less stressed during the hot summer season because Grow Bags stay cooler than the enclosed non-breathing environment inside a hard plastic bucket. Fibrous Root Mass:Grow Bags produce a far greater root mass than plants grown in hard plastic containers.This is a result of the process (air root pruning) that occurs when a root grows to the side of a Grow Bag. The root stops growing in length and then develops many fine root branches. "Root circling" is also eliminated. Lightweight:Grow bags are lightweight, most have handles and may be folded-up in the winter for storage. SUPERIORITY: MELONFARM aeration fabric fots allow roots to breathe and grow healthier, boosts plant growth and yields. USE FABRIC: Made with high quality nonwoven fabric, built-in handles for easy movement. EASY TO CLEAN: Wear-Resisting,highly tear resistant,easy to clean,can be used repeatedly. PROTECTION: Prevents roots circling and air-prunes plant's root structure, so it's better. THERMAL CONTROL: Keeps plant parmer in winter and cooler in the summer. If you have any questions about this product by MELONFARM, contact us by completing and submitting the form below. If you are looking for a specif part number, please include it with your message.